Alabama’s football program might win a ton of national titles, but they won’t be winning a spelling competition anytime soon. 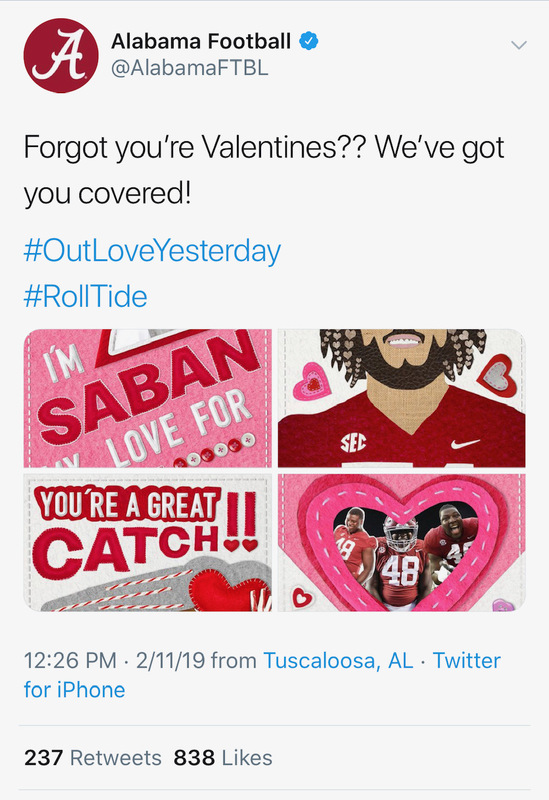 In a now deleted tweet from Monday afternoon, the football team fired off, “Forgot you’re Valentines?? We’ve got you covered! #OutLoveYesterday #RollTide.” Yes, one of the most power sports organizations on the planet doesn’t know the proper you’re/your usage. The tweet has since been deleted, but not before my trigger fingers snatched a screenshot. Take a look at this atrocity below. Look, I’m not going to make a ton of fun of Alabama here. Sure, a younger David Hookstead would have. A younger David Hookstead would have cracked a million jokes about all the lovable and fun stereotypes of people from Alabama and SEC schools. A younger David Hookstead would have gleefully pointed out that driving through Tuscaloosa is generally all you need to earn a degree from Alabama. I’m not going to do any of that. I’ve matured a lot over the past few years. Nick Saban needs to start cleaning house. It’s one thing to lose a football game. That’s bound to happen from time to time, but an elite program just can’t tolerate spelling errors. That’s not what champions are all about. Do you see programs like Clemson and Wisconsin sending tweets like the deleted one above? I don’t think so. Get better, Alabama. Get much better.